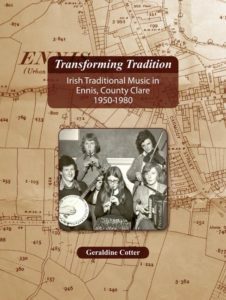 Geraldine has created a new book”Transforming Tradition” that is available for purchase now below in both printed and e-book versions! Introduces new perspectives on learning as social participation in community settings. Draws from extensive field research and interviews including national and international traditional musicians, broadcasters and local people who are at the heart of the work. To buy and download the ebook now please click on the purchase button below. Printed version costs €35 euro including Postage & Packaging to Ireland & €40 including Postage & Packaging Worldwide. Payments made safely and securely through Paypal.